Day 1 of Season of Love class, BONUS, chalkboard technique. 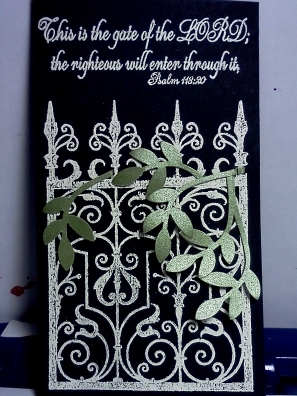 I didn't have any stamps I felt fit the "chalkboard" style so I went with this Hero Arts (K5421) Small Metal Flourish stamp and the sentiment is from Our Daily Bread Path of Life stamp set. I took the chalkboard technique one step further and stamped with Versa Mark and embossed with Ranger Seafoam White embossing powder. I used my Stampin' Up! Blossom Builder Punch and added some vines. I really enjoyed creating this and I will have to use the technique again.